Below is a very rudimentary primer on Islam concepts and definitions for the average American who does virtually no research - without which most opinions are grossly uninformed - beyond mainstream newspapers and broadcasts. It is essential to understand that Islam is a beautifully rich and spiritually lofty religion, whose precepts most Christians, Jews, and people of other faiths would gladly embrace because they have far more similarities than differences. Controversies arise from vastly different interpretations of small parts of Islam that take on epic proportions inside the Muslim community (Ummah) as well as the outside world. Caliph and Caliphate. The Caliph is the leader of the Caliphate, which is a form of Islamic government. The Caliph is the religious and political leader of the entire Muslim community, and ideally considered to be the successor to Muhammad ibn 'Abdullah, the Islamic Prophet of Allah. Difference between Sunni and Shia. Sunni and Shi'a are the two primary denominations of Islam. It is estimated that 80 percent of the world's Muslims are Sunni, while the remaining 20 percent belong to the Shi'a sect. The schism between the two denominations is the result of each sect's belief as to who legitimately succeeded to the position of Caliph of the Islamic community after the Prophet Muhammad's death in 632. Sunni Muslims affirm that Abu Bakr was chosen by Muslims to succeed Muhammad as proper protocol dictated according to Shura. Shi'as, however, do not recognize Abu Bakr's succession, favoring Muhammad's son-in-law and cousin Ali, claiming Muhammad himself declared Ali as his successor during a public pilgrimage before his death. 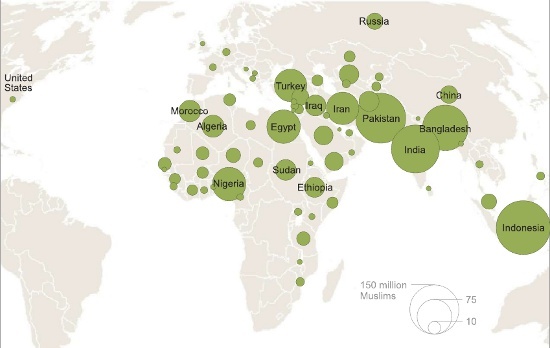 The majority of Sunni Muslims are in south and southeast Asia, China, Africa, and most of the Arab world. Shi'as are the majority population in Iraq, Iran, Azerbaijan, and Bahrain. Sharia Law. Shariah means a body of moral and religious law, which flows from the Islamic Qu'ran and Hadiths (the recorded opinions and examples of Muhammad during his life). Muslims believe sharia is the "infallible law of God." The Sunnis and Shi'as interpret both the Qu'ran and Hadiths differently in various aspects, but certainly not all. For issues not covered in the Qu'ran or Hadiths, sharia "derives" from various jurisprudence schools among the two sects, including Hanafi, Maliki, Shafi'i, Hanbali, and Jafari. According to Wikipedia (RCReader.com/y/islam1): "The sharia in these schools is derived hierarchically using one or more of the following guidelines: Ijma (usually the consensus of Muhammad's companions), Qiyas (analogy derived from the primary sources), Istihsan (ruling that serves the interest of Islam in the discretion of Islamic jurists), and Urf (customs)." Sharia law is most completely adhered to as part of the legislative process in Saudi Arabia, Iran, Iraq, United Arab Emirates, Yemen, Pakistan, Qatar, and Sudan. Fiqh: Fiqh is the school of Islamic jurisprudence, the process of deducing and applying sharia principles, as well as the collective body of specific laws deduced from sharia using the fiqh methodology. According to Wikipedia (RCReader.com/y/islam1): "While Qu'ran and Hadith sources are regarded as infallible, the fiqh standards may change in different contexts. Fiqh covers all aspects of law, including religious, civil, political, constitutional, and procedural law. Fiqh deploys the following to create Islamic laws: (1) injunctions, revealed principles, and interpretations of the Qu'ran (used by all schools and sects of Islam); and (2) interpretation of the Sunnah (Muhammad's practices, opinions, and traditions) and principles therein, after establishing the degree of reliability of Hadith's chain of reporters (used by all schools and sects of Islam)." Jihad. Jihad refers to the religious duty of Muslims to strive in the way of God, apply oneself, and struggle to preserve Islam. A Muslim practicing Jihad is called a Mujahid. Jihad meaning "holy war" is a highly controversial interpretation of Jihad among sects and schools of Islam, but general agreement exists among scholars of Islam that Jihad includes armed struggle against enemies. Organisation of Islamic Cooperation (OIC). Formerly the Organization of Islamic Conference, OIC is the largest international political representative body - second only to the United Nations itself - comprising 57 member states (including the PLO) and representing the entire Muslim world. It was founded in 1969 and is rarely referred to in mainstream news. OIC has delegations at the United Nations and the European Union. Its official languages are Arabic, English, and French. Wikipedia is well-footnoted with many links for research. There are volumes of additional information, from easy to complex, for readers to get an informed handle on one of the most important global, historical, political, socioeconomic, and spiritual realities of our time. You can find additional resources at RCReader.com/y/islam2, RCReader.com/y/islam3, RCReader.com/y/islam4, RCReader.com/y/islam5, and RCReader.com/y/islam6.